More of the same today as the markets grind higher. One signal I mentioned in yesterday’s video to watch for to indicate an overbought level is the 4 ema moving above above the upper bollinger and as of today’s close they are at par. 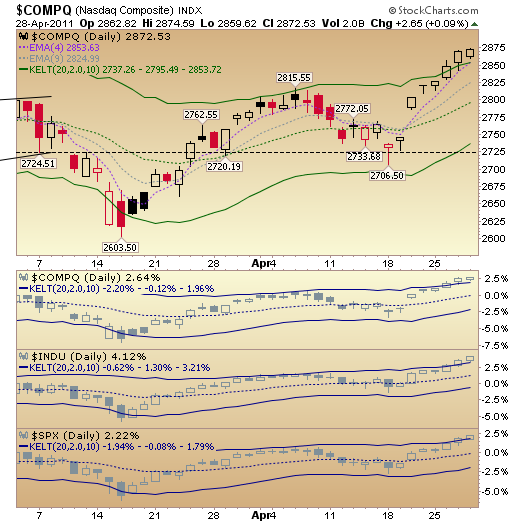 Historically this has been a good tell that the market has moved a little to far without a rest. 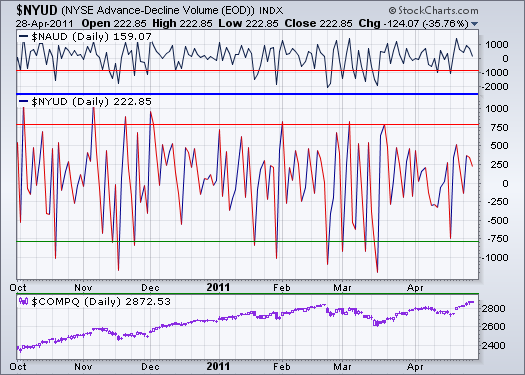 What is strange is that the NYSE Advance/Decline chart below isn’t registering in the overbought area (above 750) yet. So maybe we get one more strong intraday move higher? It’s really difficult to predict because stocks are reacting so favorably to their earnings, that one has to wonder if this isn’t the start of a really large move up.